One word I would use to describe Kim and Sherry’s wedding would be intimate. With only a small group of their closest friends and family members present these two amazing souls exchanged personal and deeply moving vows at Sherry’s family retreat - a quaint and homey seaside cottage on Fox Island. This lovely cottage has sentimental value to the ladies. It’s been in Sherry’s family for generations and is a beloved vacation spot. 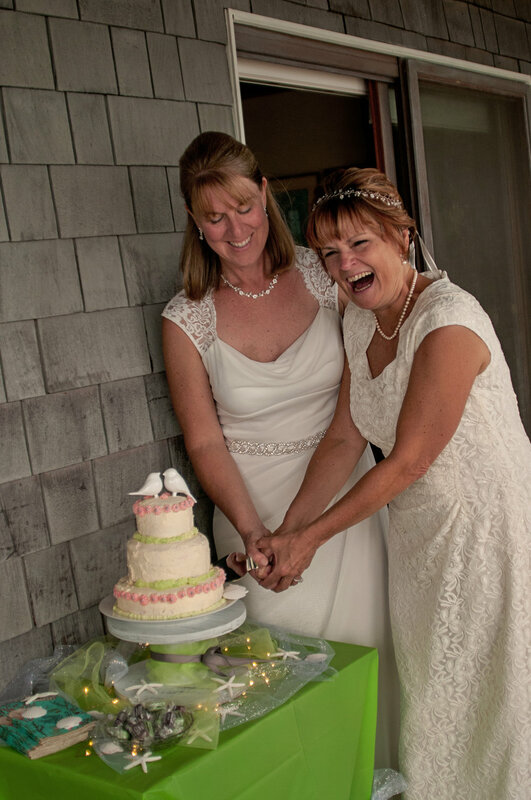 The brides decided to have an intimate seaside wedding in Washington followed by a larger reception in Portland for their extended family and large social circle. This way they got the best of both worlds… smart ladies! Sherry and Kim got ready privately in dresses that each one picked out in secret. Including sentimental pieces of jewelry worn by both ladies. Lovey, simple white flower bouquets complimented their individual styles and made everything harmonize perfectly. With the waves lapping at the property edge they each walked around opposite corners of the cottage, past blooming hydrangeas and evergreens to see each other, and then joined hands at the water’s edge to share their vows and exchange rings. The officiant and the musician for their ceremony were both long time friends, which made their contributions even more special. And Apollo, the couples precious pup was the most handsome best man you could ever ask for. The only trick was keeping him out of the ocean long enough to participate in the wedding! Apollo takes frolicking in the waves very seriously! Immediately following a ceremony that didn’t leave a dry eye in the house these two gorgeous brides served champagne and an adorable cake made by their niece. After changing into comfortable beachwear and flip flops everyone sat down to a scrumptious Pacific Northwest style crab feed as afternoon stretched into a hot summer night. This amazing wedding had all of the hallmarks for an epic love story - sand, sun, surf (an adorable pup even!) and two of the sweetest and most genuinely in love people I’ve ever had the pleasure of photographing.